In 1 November 2014, I posted on "Collecting Sylvia Plath". This post was originally part of that, but I decided to break it out for a special occasion. That occasion is today, just after the 52nd anniversary of Sylvia Plath's death. The following document was acquired from The Poetry Bookshop in Hay-on-Wye, and was something also formerly belonging to long-time BBC producer Fred Hunter (obit; another obit). Rosenthal and Al Alvarez will be in the Chair. of Sylvia Plath reading her own poems. Initially, I thought this evening was planned for 1963. The archival record suggested that it originally was. The ICA's archive is held by the Tate Museum in London. On contacting them, I inquired if they had any event materials pertaining to this evening, as well as any possible correspondence. There was no material for the event, and a search of correspondence found just one letter from the ICA's Dorothy Morland (obit) to Ted Hughes dated 26 February 1963 (15 days after Plath's death). In this letter, Morland expresses interest in the ICA hosting the memorial evening. It would feature "readings of her poetry with only a short introduction". She discussed the event with Alvarez who "expressed some doubts"; though Alvarez said he would talk it over with Hughes. The letter also mentions that Alvarez would be absent all of April. There is a chance the event took place, then, in May. But then again, nothing appears to have taken place that year.There was no reply letter from Hughes found in the ICA's archive. However, as a few people pointed out in emails to me (thank you Paul, Sheila, and Tim), there was a "Sylvia Plath Memorial Evening" held on 29 April 1965. According to WorldCat, UNC at Chapel Hill holds a copy of the ICA Bulletin for April 1965 detailing that the programme would be "illustrated with recordings of Sylvia Plath reading her own poems." The three page Bulletin includes a "brief biographical and bibliographical entry for Plath opposite on p. 2." The failure of the ICA to host this event in 1963 suggests that Ted Hughes did not want them to celebrate her life -- or possibly call attention to her recent death. Instead, the timing most likely coincides with the publication late that winter (11 March) of Ariel. 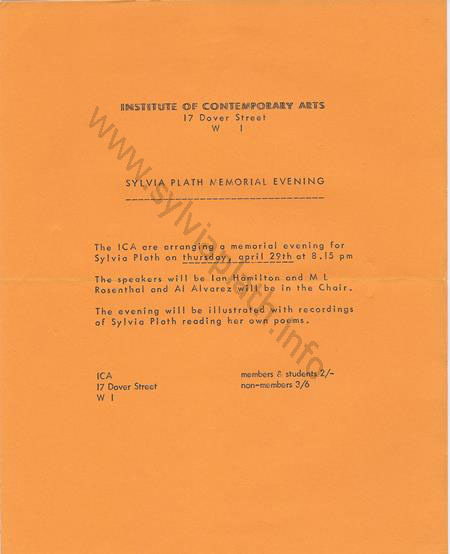 Plath had a little history with the ICA in London which was discussed a bit in this blog post. The ICA when Plath was living was located at 17 Dover Street (map) London. My thanks to Allison Foster of the Tate Museum Archives for her assistance with my queries. And, again to Paul, Sheila, and Tim for their emails and helpful information. Initially I thought that the event would have taken place in 1963 and failed to consider that it might have happened in another year. All links accessed 2 & 8 July, 1 October 2014, 21 January and 17 February 2015. The post was significantly revised on 20 and 22 February 2015. 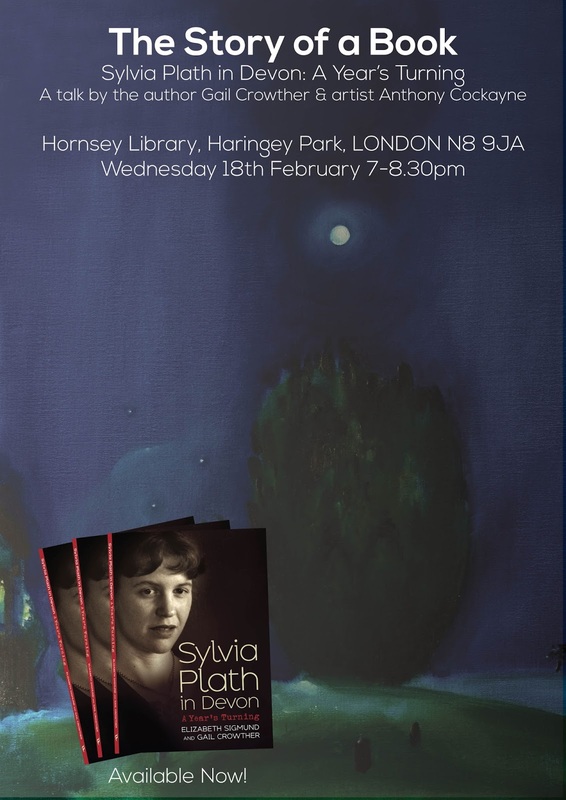 Gail Crowther and Anthony Cockayne will be speaking on Sylvia Plath in Devon: A Year's Turning in locations around England commencing on 18 February 2015 at the Hornsey Library. Additional talks are in the works for Cambridge, Cumbria, Manchester, and Plymouth. In 2014, British artist Anthony Cockayne completed the oil painting "The Moon and the Yew Tree" that appears on the back cover of Sylvia Plath in Devon: A Year's Turning following a suggestion in 2013 by author Gail Crowther, proposing the idea. Cockayne had made a visit to the churchyard of St.Peters in North Tawton in 2012 and so had experience of the poem's setting and fascinatingly had read "The Moon and the Yew Tree" aloud, whilst close to the Yew, to two friends who had driven him there. The experience was incalculable during the creation of the painting. The original oil on linen painting measures 49cm x 49cm, taking its measurements from the lead in Hughes's poem "Fairy Tale " from Birthday Letters, when he states "Forty-nine was your magic number" (159). During the painting's development a further Hughes line and the very last in Birthday Letters had a considerable bearing on its look: "But the jewel you lost was blue" ("Red", 198). The intention was to restore the Blue in the painting. A pigment print on Canson etching paper,is available in an edition of 49, the image size corresponding with the original work. An unframed print is available through contact at www.anthonycockayne.com. Price 200 GBP. Postage and Packing not included in the price. 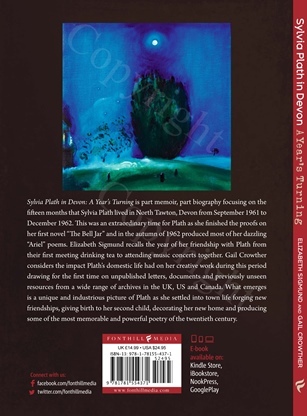 It is not my intention to review Elizabeth Sigmund and Gail Crowther's recent book Sylvia Plath in Devon: A Year's Turning (Fonthill Media, 2014). However, if parts of this post sound like a review it is merely coincidence. Having contributed the introduction "Writing Life" to the book and been a witness to it in all its stages -- from manuscript to proof to the printed form -- the book is in many ways too close. However, having said that, I do not think there is anything wrong with either commenting on Sylvia Plath in Devon or promoting it. And what better day to do it than today, 11 February 2015, the 52nd anniversary since Plath's death. A day to celebrate Plath's life, which Sylvia Plath in Devon does. Though some might say I am biased, I simply cannot recommend this book highly enough. 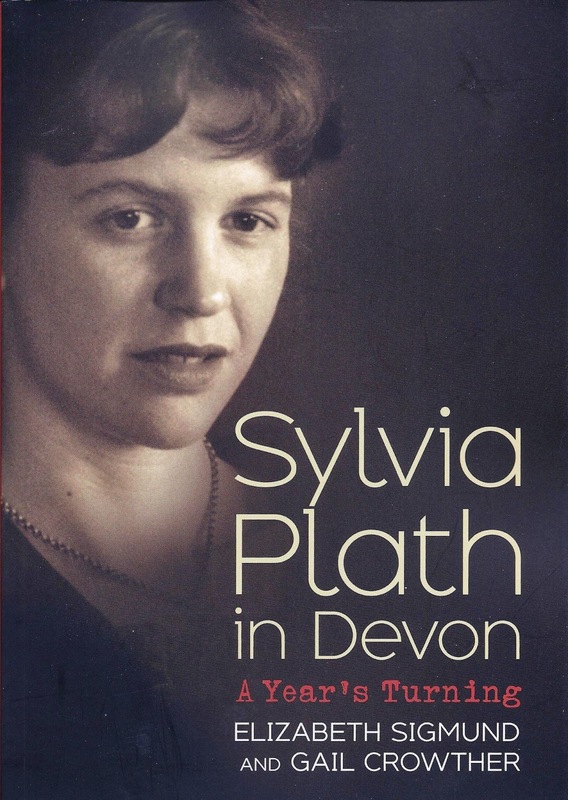 Sylvia Plath in Devon is written with care and compassion which is a direct reflection on the all-too brief but meaningful friendship between Elizabeth Sigmund (then Compton) and Sylvia Plath. The true nature of the friendship, and just how much it meant to Plath, is evident in the simple act of Plath famously turning to Elizabeth for comfort on the difficult day in July 1962 when Ted Hughes' infidelity was confirmed. Also in Plath dedicating her first novel The Bell Jar to Elizabeth and her then husband, the writer David Compton. Elizabeth's memoir of Plath is a wonderful read, recalling many of their meetings. What is remarkable is how clear the memories are, how deeply ingrained they are in Elizabeth's being, how even after Plath's death she was a strong and vibrant presence in her life. As well, how Plath's life seemed to connect and intersect with Elizabeth's after Plath's death. These connections might have been illuminated had Plath lived, but I find it truly remarkable that they were made, sometimes decades after Plath's death. The cohesiveness transferred to Gail's full-length chapter on Plath's time in Devon from September 1961 to December 1962. Major works by Plath are discussed, and the narrative reads smoothly, as Gail expertly weaves together a thorough and compelling story of Plath's life and times. Drawn from a careful intertextual assessment of Plath's archives: letters, personal papers, working manuscripts for poetry, radio recordings and broadcasts, realia, and much more, Gail's chapter highlights what mattered most to Plath during this period: her writing, her family, culture, and the development of a country identity and presence. Sylvia Plath in Devon assumes prior knowledge of Plath's life, of her first 29 years. When necessary, Gail dips both into pre-Devon life and also at Plath's death. It is not an easy book to read, very emotionally charged as the subject seems always to be. But rather than dwell on mistakes and pass judgement on the behavior of people now gone, Gail sticks solidly to Elizabeth's example of exuding tact. Elizabeth has an amazing soul and vivacity, her voice and laugh when I hear it keeps me on a high for days. And I can just imagine how easily Plath took her. As each chapter of Sylvia Plath in Devon: A Year's Turning was written, and as I worked on the introduction, I felt Elizabeth's strong presence as a guiding force; an unconscious and unstated dictum that this book be about nothing other than her friend Sylvia Plath and her achievements. Buy it from Amazon.com, Amazon.co.uk, or Book Depository today! All links accessed 30 January and 2 February 2015. The BBC has recently launched something called BBC Genome (currently in BETA). The site "contains the BBC listings information which the BBC printed in Radio Times between 1923 and 2009. You can search the site for BBC programmes, people, dates and Radio Times editions." As you might have guessed, I searched for … Sylvia Plath. I also searched Ted Hughes and Frieda Hughes. The website offers two major ways to access listing information. One is a blanket, standard search (with advanced searching available, too). Another is to browse the separate issues of Radio Times (and by doing so, you can see a select few of the actual covers -- greedily I would love to see them all). I like both methods, but have to admit it is easier to search the Radio Times listings if I know the exact date for the broadcast in which I am interested. For example, Sylvia Plath's "Three Women" was broadcast on 19 August 1962, and thus appeared in the 16 August 1962 issue of Radio Times in the Third Programme section. It is fascinating to see what else was on at the time, and to try to guess whether Plath listened to the other programs on at the time. "Three Women" was re-broadcast on 13 September 1962, which was when she was in Ireland. 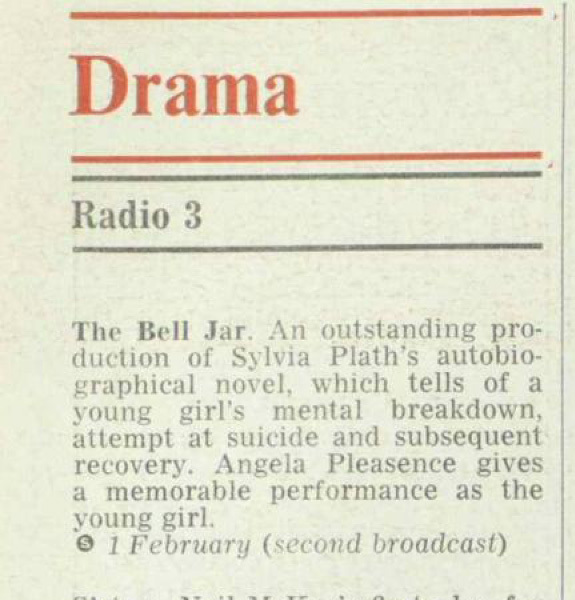 In browsing the search results, I learned that Plath's novel The Bell Jar was dramatized on the BBC's Radio 3 on 29 December 1974 (and again on 1 February 1976). The adaptation was about 70-80 minutes in duration. Would love to hear it. (Hint hint.) And review it. (Hint hint). The data in many of these search results is not as granular as I would like, but I am perhaps unreasonable given the massive breadth of what the BBC would have to do to present all the information. Such as I would love the site to present the poems read by title. Through my own research and consulting published works by Stephen Tabor and Kate Moses, among others, I have captured this level of detail on my website for Sylvia Plath, so at least I feel we are covered from that angle. But, my website really only concerns itself with broadcasts during Plath's life time. And what you see in BBC Genome is the fuller history of Plath herself on the British radio (during her lifetime and posthumously) but also those programmes that she may have listened to during her time at Cambridge, in London, and in Devon. Plath regularly listened, for example, to foreign language programmes in German and Italian, which is noted in her 1962 Letts Calender. The BBC's other publication, The Listener, is also available online (news about it here). However, unlike the Genome, The Listener Historical Archive is not free. Though some might find access to it as I did through their local public and/or college libraries. Also a terrifically vital resource, The Listener archives should certainly please you. The page images (an example is to the right), are accessed via full-text search capability that is very accurate, are in full color and are downloadable. If you are interested in seeing the covers of Listener issues that featured Plath's poems, please head over to the periodical covers page on A celebration, this is. But, please do not forget to come back. If you have access to both the BBC Genome and The Listener . . . well, let's just say you can and should call it a party. All in all, BBC Genome is a wonderful resource. The website is easy to use and to navigate, and I get a certain thrill being able to browse the Radio Times this way knowing that Plath, herself a subscriber to the Radio Times, browsed it in the original version. Many of the Genome's pages are already cached by Google, so you can always quickly search "Sylvia Plath" "BBC genome" and feel happy about the results. Go on, get lost in history. Kind thanks to Dr Ann Skea for letting me know about the resource. All links accessed 8, 20, 28 January 2015.